Mr. George Galanakis holds a Law and Political Sciences degree from the University of Athens. He practiced Law for 15 years in Athens, specializing in maritime law, shipping finance and shipping litigation. He is a Board member of numerous Greek and foreign owned shipping companies. Mr. Galanakis has also vast experience in the hotel sector where he holds executive positions in hotel owning companies. He served as President/CEO of Hyatt Regency, a hotel and casino company, for the years 1994-2006 and 2011-2017. 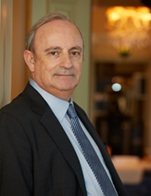 Among others, he currently holds the position of the President of the Board of Directors in the Greek listed Company "LAMPSA Hellenic Hotels SA", a company which owns 6 hotels in Greece and Belgrade, the most known ones being the landmark hotel "Grande Bretagne", "King George", "Sheraton Rhodes" and "Hyatt Regency Belgrade".